Hometown: Ocean, New Jersey, U.S.
Died: September 18, 2003 in Operation Iraqi Freedom. Unit: Army, Headquarters and Headquarters Company, 3rd Brigade Combat Team, 4th Infantry Division, Fort Carson, Colo.
Army Capt. Faunce was assigned to Headquarters and Headquarters Company, 3rd Brigade Combat Team, Fort Carson, Colorado. Faunce was electrocuted by a low-hanging wire hidden among trees while traveling in a Bradley Fighting Vehicle northwest of Baghdad. He was given first aid but died later at a military hospital. He was involved in a chase of hostile Iraqis who were found tampering with a disabled, Russian-made armored vehicle. Brian graduated from Bensalem High School in 1992, Bucks County, PA. He attended Penn State University on an ROTC scholarship where he graduated in 1996 with a bachelor's degree in Spanish. He entered active duty on August 10, 1996. Brian was known as a commander who rarely slept and could draw up attack plans faster than anybody else. He was a graduate of Airborne School, the Infantry Mortar Leader's Course, the Infantry Officer's Basic Course, Ranger School, the Infantry Captain's Career Course, and the Combined Arms and Services Staff School. His awards and decorations include: the Bronze Star Medal, the Meritorious Service Medal, the Purple Heart, the Army Commendation Medal with one Oak Leaf Cluster, the Army Achievement Medal with one Oak Leaf Cluster, the Multinational Force and Observers Service Medal, the Combat Infantryman's Badge, the Expert Infantryman's Badge, and the Army Parachutist Badge. His wife, Cheryl Skeide Faunce, survives him. 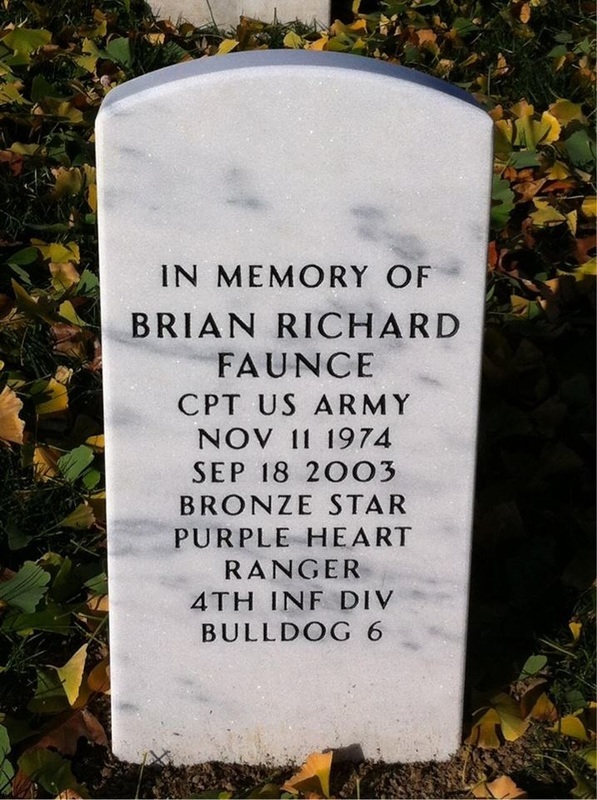 CPT Brian R. Faunce was a 1996 graduate of Penn State University with a Bachelor of Arts degree in Spanish. He entered Active Duty on 10 AUG 1996. His previous assignments included Rifle Platoon Leader, Company Executive Officer, and Headquarters Company Executive Officer in the 1st Battalion, 32nd Infantry, 10th Mountain Division, at Fort Drum, NY. Upon completion of the Infantry Officer’s Career Course in February 2001, CPT Faunce was assigned to the 2nd Battalion, 9th Infantry Regiment, 2nd Infantry Division, in the Republic of Korea, where he served as the Battalion Assistant Operations Officer. Upon returning from Korea in 2002, CPT Faunce was assigned to the 3rd Brigade Combat Team at Fort Carson, Colorado as an Assistant Brigade Operations Officer as the Chief of Reconnaissance. Most recently, CPT Faunce served as the Commander of the Bravo Company, “Bulldog,” 1st Battalion, 12th Infantry Regiment. CPT Faunce was a graduate of Airborne School, the Infantry Mortar Leader’s Course, the Infantry Officer’s Basic Course, Ranger School, the Infantry Captain’s Career Course, and the Combined Arms and Services Staff School. CPT Faunce’s awards and decorations include: the Bronze Star Medal, the Meritorious Service Medal, the Purple Heart, the Army Commendation Medal with one Oak Leaf Cluster, the Army Achievement Medal with one Oak Leaf Cluster, the Multinational Force and Observers Service Medal, the Combat Infantryman’s Badge, the Expert Infantryman’s Badge, and the Army Parachutist Badge. 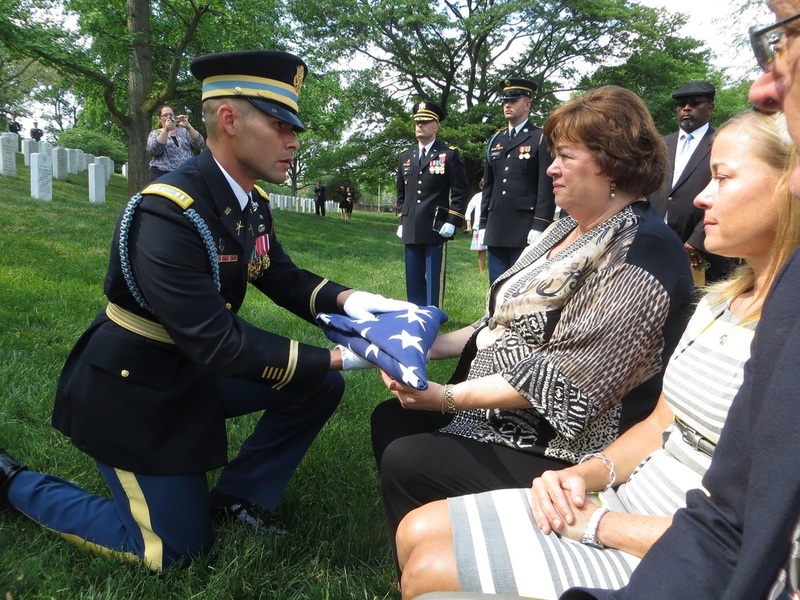 CPT Faunce is survived by his wife, Cheryl Skeide Faunce, of Colorado Springs, CO, his father Richard Faunce of Morrisville, PA and his mother Judith Faunce of Wilmington, DE, and sisters Danielle and Samantha Faunce. Acting on a tip about a hidden cache of weapons, Capt. Brian R. Faunce's company raided a house in Iraq. Faunce made one thing clear. "He said, 'Just make sure that once you tear everything apart, you put everything back just the way you found it,'" recalled Staff Sgt. Shawn Dodd. "I said, 'Are you serious?' And he said, 'Yeah.'" Faunce, 28, of Philadelphia, died from electric shock after touching a low-hanging power line Sept. 18 in Iraq while he was in a Bradley fighting vehicle. Stationed at Fort Carson, he was known as a commander who rarely slept and could draw up attack plans faster than anybody else. Maj. Joe Golden said Faunce did not fear his senior officers. "He respected them enough to tell them the right answer, not what they wanted to hear," Golden said. "Brian was a guy you knew you could rely on because he always did the right thing, even when no one else was watching."